As described in a recent post, in partnership with the Karen Organization of Minnesota (KOM), WellShare aims to engage the local Karen community, and those that serve them, in culturally-specific health education. 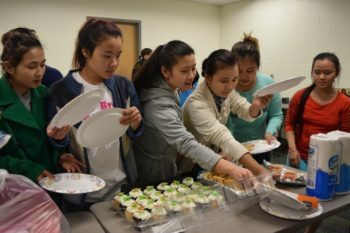 Last month, on Friday, May 13th, we celebrated the graduation of a unique “Karen Health Group” at the Hub Center at Harding Senior High. 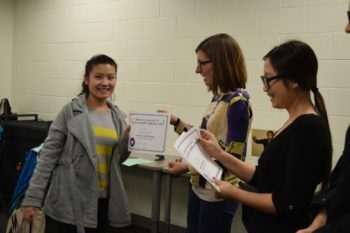 WellShare’s Program Manager, Ashley Mitchell was able to present certificates to each participant along with KOM staff members Julyna Loo and Jenna Nomeland. A total of 13 Karen young adults participated in at least one of the free learning sessions. 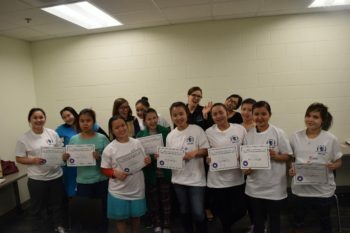 This group was special because every participant was a young mother, and the group met weekly over the course of three months to learn together about a variety of health topics. WellShare was invited to partner and present lessons from our co-authored Reproductive Health and Health Care Access curriculum for the final six sessions. Similar to the first group held in 2016, lessons were facilitated by Julyna ‘Law Law’ Loo, a Community Health Coordinator at KOM contracted by WellShare. A variety of interactive lessons were taught, in the Karen language, on health topics including: Reproductive Anatomy Basics, Family Planning, and Parent-Child Attachment. The class steadily showed improved knowledge and understanding throughout pre- and post-evaluations. One participant shared that she “learn[ed] about women bodies and [she] know[s] more about how they have a baby”. The lessons equip and prepare community members with knowledge and tools to make informed decisions about the health and wellbeing of themselves, their family, and their community. Participants of the recent graduation, many of whom also graduated from high school this spring, are pictured below. We are thrilled to be able to continue to partner to conduct additional community-based health groups throughout the year thanks to generous funding by the Minnesota Department of Health, Family Planning Special Projects grant. Additionally, these pictures were taken and shared by Rebekah Jacobson, Community Engagement Specialist at KOM – thanks Rebekah!